So this week Hellboy II comes out, and advance word has it that Guillermo del Toro has forgotten about creating three-dimensional characters and instead spent all of his time trying to dazzle us with special effects. Of course, you might remember a time in the sixties and seventies when three-dimensional characters were special effects—in which case you should get yourself down to the Fox Theatre to check out the 3D Film Festival. We’re kind of amazed that this festival snuck out of nowhere! It’s pretty exciting! The fairly lengthy trip out to the Fox (it’s at 2236 Queen Street East) is going to be totally worth it to see a masterpiece like Dial M for Murder in 3D (starting at 7 p.m. tomorrow night) or a rare oddity like Andy Warhol’s Flesh for Frankenstein 3D (starting at 9:15 p.m. tomorrow night). Oh, and don’t worry—they’re providing the 3D glasses. Also in 3D this week is Journey to the Center of the Earth, which stars the for-some-reason reliably likable Brendan Fraser. NOW‘s Andrew Dowler says its script “is very pro-science and, in its open admiration for Jules Verne’s source novel, pro-literature.” Which is nice. That actually allows us to segue right into talking about Meet Dave, which we mention despite its status as an Eddie Murphy vehicle because it was written by Crow T. Robot, or rather, one of his human incarnations, Bill Corbett. Eye‘s Adam Nayman laments that “the script … is a collection of obvious embarrassment-humor gags … tempered by eye-rolling sentimentality,” which means the Rifftrax is surely going to be a must-hear. 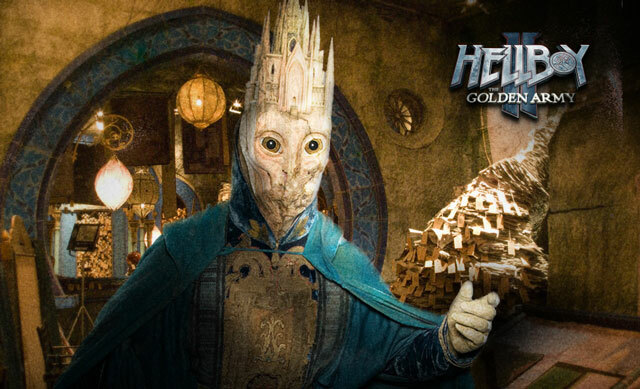 Back to Hellboy II: The Golden Army though. Wasn’t a massive fan of the original—thought it was a bit dull even if it did feature nature’s perfect baddie, supernatural Nazis—but at least it was very “Hellboy.” The Golden Army looks exactly like Pan’s Labyrinth with Hellboy instead of a little Spanish girl. To be completely honest, we find Del Toro’s imagination overrated, especially considering one of his new characters for the film is called “Cathedral Head” and has a cathedral for a head. We’re sorry, but there’s only one creature allowed to have a totemic building for a noggin, and that’s Pyramid Head. Also out this week is The Wackness (from All the Boys Love Mandy Lane director Jonathan Levine), reviewed positively by some (but it does seem to depend if you can stand Ben Kingsley’s idiosyncratic acting style in the film). The 4th Life plays the Carlton, and Alice’s House and Silent Light play the Royal. There are some other festivals too—the Caribbean Tales Fokus Jamaica Film Festival (including a screening of midnight movie classic The Harder They Come) and the Missisuaga Indie Film Festival, not to forget Cinematheque Ontario‘s continuing summer season or the Bloor’s continuing season of general excellence, which this week includes the superb final cut of Blade Runner and a clever double bill on Tuesday of Lost Highway and Mulholland Drive starting at 7 p.m. We’ve always considered Mulholland Drive a more successful take on the same themes seen in Lost Highway, so it would be great to see the pair together.